WARNING: This post might contain sarcasm. 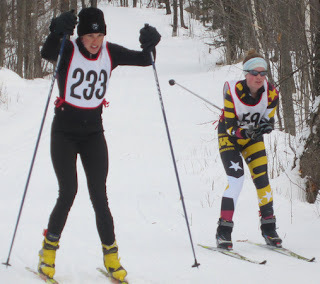 Yesterday, I raced my very first cross country ski race - the Spirit Mountain cross country ski race in Duluth, MN. With a solid foundation of about four weeks being on skis, I knew exactly what to look for when screening the flyer of the race description – what is the cut-off time? Although I was assured multiple times that this would be no problem for me, I was not entirely sold on it. Cross country skiing is said to be all about technique and the only accomplishment in xc skiing so far for me is that I actually move forward. I had the options between 11k or 25k skating. No question, I chose the longer one. If there had been an option for 60k, I probably would have signed up for that one…always having the speed of a cyclist in the back of my head. Well….I would learn very quickly that skiing is a little slower than cycling. Just a little. Maybe a little more. Maybe quite a lot more for a beginner. At the start line, the announcer asked everyone to place themselves in the order one believes to finish in. Well, that was easy. Taking the gunner position of maybe 100 starters, I was ready for my first and longest distance of 25k. The snow was new and soft and as I learned later, was slow. Well, that made two of us. Within a few minutes of the race, I did not have to worry about poles or skis everywhere. I had the entire length, width, breath and depth of the ski trail for myself. It all of a sudden became very quiet and peaceful gliding in the soft snow in the Northern Minnesotan forest, only the noise of a crooked skating technique and an occasional German swearword. It was almost too peaceful. I zoned out. The last few racers that must have gotten lost behind me now finally passed me. But now, I had the forest to myself again. For a long time. I could have skied forever, if my triceps, biceps, back, deltoid, and lats wouldnt have started telling me that I usually dont use them quite that extensively. It would have taken me a solid three minutes to stop safely without crashing, take off the poles, take off the first set of gloves, take off the second set off gloves, reach into my back pocket to get a gel, eat the gel, put on the first set of gloves, put on the second set of gloves, struggle to put the two sets of gloves through the small handles of the poles and then keep going. I opted for being hungry. Time went by and I slowly chewed up the kilometers. And eventually I crossed the finish line. I had a blast! With the upcoming Birkebeiner of 50k, this was for sure a good experience as to what can be expected in two weeks!